PLUTONIUM is a silvery, warm to touch isotope (radioactive element) which can only be produced by man, it does not occur naturally. It corrodes very quickly and is liable to sudden transitions.The UK has a lot of plutonium  the largest civil stockpile in the world, totalling some 112 tonnes, most of it from reprocessing spent fuel over the years. The question of what to do with Britains plutonium has vexed subsequent governments for decades. In 2018 the UK government hopes to bury the plutonium underground in a proposed GDF (nuclear dump) The government panel stated : "A type of higher activity radioactive waste which would comprise part of the inventory for disposal in a GDF is plutonium stocks. 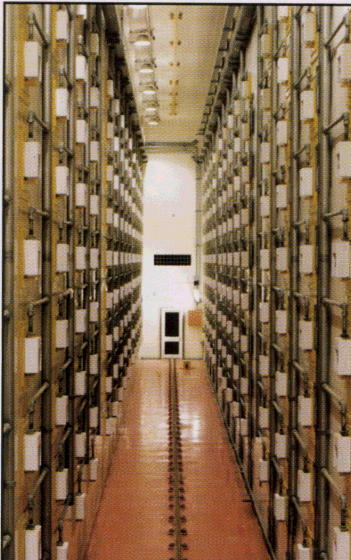 Plutonium stocks would be in a form suitable for long-term disposal (this may be following re-use and subsequently contained in spent nuclear fuel, immobilised, or a combination of both). To be informed by the Paymaster General, Reginald Maudling; At the request of the Government, the Central Electricity Generating Board has agreed to a small modification in the design of Hinkley Point and of the next two stations in its programme so as to enable plutonium suitable for military purposes to be extracted should the need arise. The modifications will not in any way impair the efficiency of the stations. As the initial capital cost and any additional operating costs that may be incurred will be borne by the Government, the price of electricity will not be affected. The Government made this request in order to provide the country, at comparatively small cost, with a most valuable insurance against possible future defence requirements. The cost of providing such insurance by any other means would be extremely heavy. The UK and US then agreed a mutual exchange deal.The reason there was a swap between the UKAEA and the USAEC of weapons suitable HEU and Pu, was the AEC had huge surpluses of HEU from OakRidge in the early 1960s, but wanted more plutonium than Hanford could deliver; while the UK first generation "commercial" Magnoxes, which were scaled up pu production factories based on Calder Hall at Sellafield were perfect for producing military suitable pu, as they had on-line refuelling sysems, allowing much more sensitive control of the core, to optimise pu over electricity production. They produced perfect pu, in surplus, but the UK lacked sufficient HEU, so an exchange deal was thus mutually beneficial. Without safeguards or non proliferation norms, yippeee, lets make bombs from everything! So far the world has produced 700 tonnes of PU. The UK has stockpiled 65 tonnes. Sellafield produces about 1.5 tonnes a year and hopes THORP will produce 6 tonnes p.a. It is stored as Plutonium oxide. Waste plutonium from Scotland is also now moving to Sellafield (2012). RAIL shipments of nuclear material from the north of Scotland to England have begun. Around 90 journeys have been planned between the two facilities. Shipments will cost an estimated £60 million. A total of 44 tonnes of breeder material is being transported 400 miles for reprocessing into plutonium and uranium to be used as fuel at other nuclear plants. Information 2007/8 on inventory of uranium/plutonium held by NDA. In MOX fuel one tonne MOX is 6.7 kilo U235 with 38.6 kilo plutonium and 954 kilo U238. Some PWRs can run a quarter load MOX, however British Energy has cautioned that they are not keen to use MOX because of increased safety shielding needed at various locations. This view that plutonium was not to be used in UK reactors was stated in House of Lords, HL Paper 41(1999)p62. July 1987, Michael Spicer, then Energy Secretary said;"The balance of plutonium produced in the CEGB's Magnox reactors was consigned to the UK-US defence agreement as stated by the Prime Minister on April 21, 1964, and was used by the US for civil purposes.Because of the barter arrangements under which plutonium is consigned it would not be in the national interest to publish these figures." Plutonium discharges to sea from Sellafield have fallen from 50 tera Bequerels in 1979 to 2.7 in 1986. (source H. of Commons) The levels have been reduced considerably by the EARP effluent treatment plant at Sellafield. However as plutonium has a half-life of 27,000 years the deposits in the seabed and mudflats around the Irish Sea shores will retain this legacy of Sellafield well into the next millennium. The government appointed RWMAC committee stated in May 1999: "RWMAC supports the House o Lords Select Committee recommendation that the government should develop and declare a clear policy for the management of the UK's stock of separated plutonium. It agrees that there can only be a limited use for the stock in the foreseeable future and that the remainder of the plutonium should be declared a waste unless a credible reason for doing otherwise can be given.'' Sellafield's plutonium can be detected in sea waters in the North Sea and on the European coast. In 2006 it was alleged plutonium from Sellafield was sent to Israel to help them develop their own nuclear weapons according to a BBC news programme. According to BBC TVs Newsnight programme, the UK supplied Israel with quantities of plutonium while Harold Wilson was prime minister. The plutonium and heavy water were sold despite a warning from British intelligence that it might "make a material contribution to an Israeli weapons programme". *The UK nuclear industry wanted to use up the world's largest inventory of plutonium in MOX fuel. But making MOX is not simple and the UKs recent record is not good. A MOX plant at Sellafield, part of the THORP reprocessing facility, cost £1.2bn but only produced five tonnes of fuel per year for its first five years, despite a 120-tonne-per-year design capacity, and closed down owing to lack of customers. National Totals as of 31 Dec. 2007 (Previous year's figures in brackets) Rounded to 100 kg plutonium with quantities less than 50 kg reported as such. March 2011 The Daily Telegraph reported a reference to Sellafield's MOX plant in Wikileak cables: "A week ago The Daily Telegraph published a confidential cable from the US embassy calling a controversial plant at Sellafield "one of Her Majesty's Government's most embarrassing failures in British industrial history". Then, within days, ministers said they were minded to build another one like it. The embassy was not wrong. The so-called Mox plant, which makes nuclear fuel out of uranium and plutonium at the Cumbrian nuclear complex, is not just  as the cable put it  a "white elephant", but one that could well go rogue. Built at a cost of £473 million, despite repeated warnings that it would be uneconomic and could be a security risk, it has never worked properly. Supposed to churn out a grand total of 560 tons of fuel by the end of its first decade of operation, later this year, it has so far produced just 15. Even though the Government wrote off its capital cost, it is still haemorrhaging money. Though the annual loss is kept secret, the cable  passed to this newspaper by WikiLeaks  states that it is "costing taxpayers £90 million a year" It remains, it adds, "a black mark for the entire industry". Yet, unbelievably, ministers seem keen to repeat the exercise. The Department of Energy and Climate Change (DECC) published a little-noticed consultation document this week that made it clear that its "preferred option" was to build another Mox plant as "a proven technology" that offers "the best prospect" of finding a solution for our vast stockpiles of plutonium. But even if it works this time, it will greatly increase the chances of terrorists getting nuclear weapons. The problem is that Britain has the dubious distinction of being the world's civilian plutonium capital, with 112 tons of it  about half the global total  almost all stored at Sellafield." The treatment of material sent for direct disposal will need further consideration when specific plans for direct disposal have taken concrete form. Legacy plutonium discussed in this statement in Parliament, October 2011....In our consultation on plutonium management we set out three high-level options for dealing with plutonium: continued storage; immobilisation followed by disposal as a waste; and reuse of the plutonium in the form of MOX fuel. The consultation set out at a high level the advantages and disadvantages of each option, but the Governments preliminary view was that the best prospect of implementing a successful solution lay with the option of reusing MOX as a fuel and, therefore, with seeing its value rather than simply its cost, as the hon. Gentleman rightly called for us to do. That option was the more technically mature, given that MOX fuel had been successfully fabricated and used in reactors in Europe, and given that by comparison no equally mature immobilisation technology was readily employable. Nevertheless, we recognised that there were still risks with the reuse-as-MOX option, particularly given the poor performance of the Sellafield MOX plant. The poor performance put limitations on throughput, which meant that, even if we wanted to use it, the Sellafield MOX plant would never be able to deal with all the UKs plutonium. aware, the UK also stores significant quantities of overseas-owned plutonium, so pursuing a reuse-as-MOX option for UK plutonium could offer an opportunity for the overseas owners of plutonium currently stored in the UK to have their plutonium managed in the same way. Mr Reed: The Minister is making a series of important and well thought-through points, which I welcome. On overseas materials and foreign waste, could we at some point in the very near future sit down with concerned parties to undertake a scoping exercise with regard to what happens to the waste currently stored in my constituency which, in the event of Scottish independence, would no longer be British waste? Charles Hendry: That departs just a little from the subject of the debate, and, although the hon. Gentleman is determined as I am to see off that threat, we are dealing with an issue that is not going to arise. However, in the event of separation there would clearly be implications for a settlement and they would need to be addressed and resolved. It is premature, however, to sit down and deal with those issues at this stage. Were we to proceed down the path of a reuse, any new MOX plant would need to learn from the lessons of the past and take into account the experience from overseas. Additionally we anticipate that, for security reasons and to minimise the transportation of plutonium, any new MOX facilities would be located as close to the plutonium as possible and most likely in west Cumbria, which I believe many of the hon. Gentlemans constituents would actively welcome. Plutonium management is a high-profile issue that requires appropriate consideration, and it is not a decision that can be taken quickly. The Government are in the process of clearing our response through Cabinet, and we anticipate being in a position to publish our response shortly. I, like the Prime Minister, have made it clear that nuclear should remain part of the future energy mix, alongside other technologies such as renewable and carbon capture and storage, provided that there is no public subsidy for nuclear, and the Weightman report, published today, provides no grounds to question our approach that nuclear should be part of the energy mix in future, as it is today. The next step on plutonium management is for the Government to publish their response to the consultation paper, and, as I have just said, we are in the process of clearing our response through Cabinet and anticipate being in a position to make an announcement shortly.